In this photo, you can see our equipment set up inside of an office where a portion of ceiling collapsed from wind and rain after a storm. Normally, we would move furniture and other contents inside of the room to prevent carpet staining and secondary damage, but the business had to stay open during our work. We were able to work around the employees and vice versa to get everything back to normal. 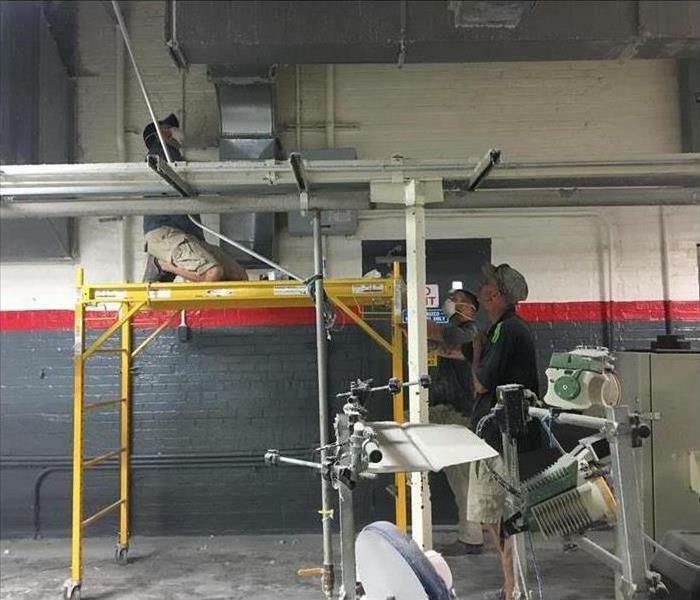 This is a photo of our crews cleaning the air ducts at Standard Textile- an industrial manufacturing facility in Thomaston. In this photo, our owner Marc is running a pressurized hose inside of one of the ducts to remove cotton, dust and debris that has settled inside the duct work. Time is a crucial element in responding to water damage inside of a home. The longer water is allowed to sit, the greater the damage to flooring, carpeting and other building materials. In this case, you can see the line where moisture has traveled up the side of this wall. Our crew had to pull the baseboards and 1/4 of the wall around the room in order to get proper airflow to dry the wall cavity and prevent microbial growth. Here is a look inside one of the trailers we use to transport drying equipment. 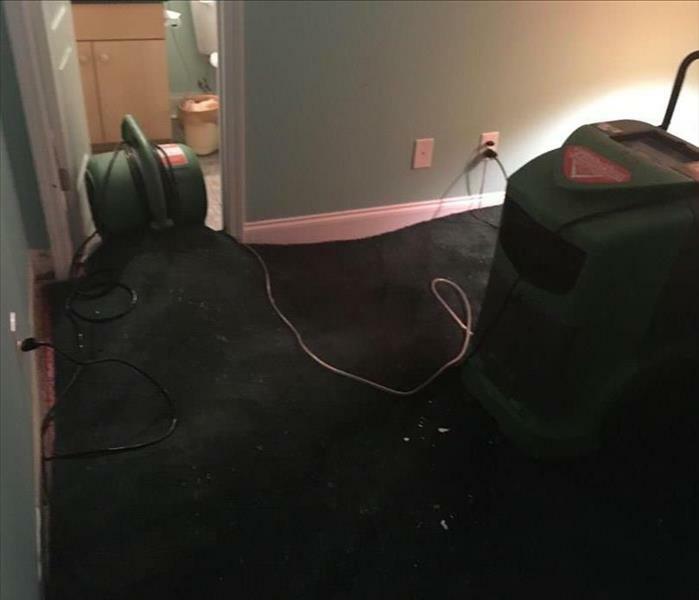 In the photo, you can see stacks of air movers and dehumidifiers that we typically set up inside homes and businesses that suffer water damage to speed up the water evaporation process. The quicker we can remove excess moisture, the lesser the damage. HEPA vacs, as we call them, are vacuums that use a five stage filtration system, filtering out 99.7% of particles as small as .3 microns (in comparison, a grain of beach sand is 100 microns). 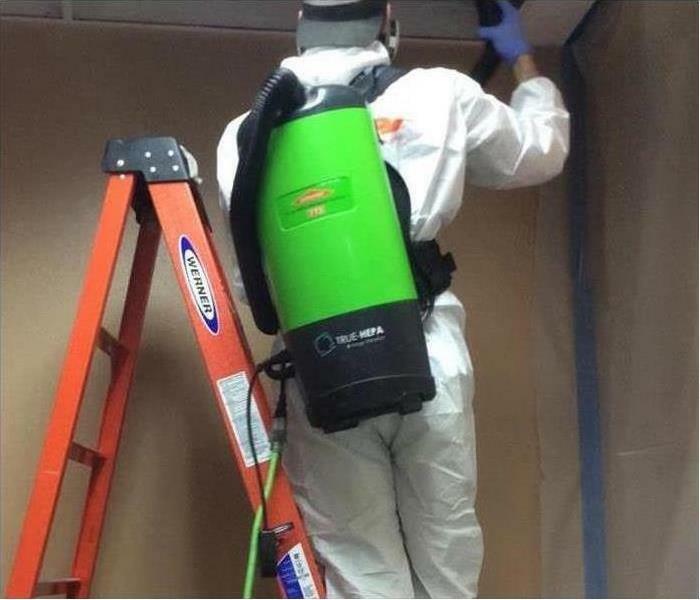 In this photo, you can see a member of our crew wearing a portable HEPA vacuum to remove microbial growth near the ceiling of this room. 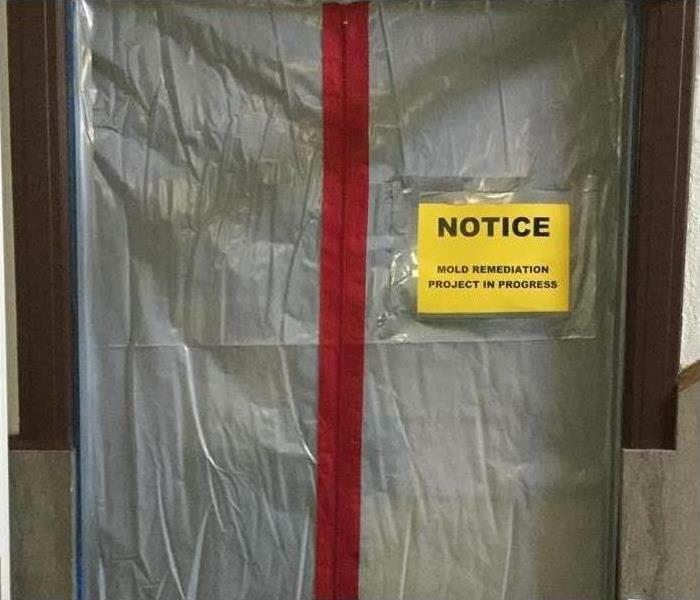 Containment is set up to help limit the spreading of any type of microbial growth during the remediation process. This is one of several preventative measures put in place to make sure mold spores do not spread while crews are inside cleaning. 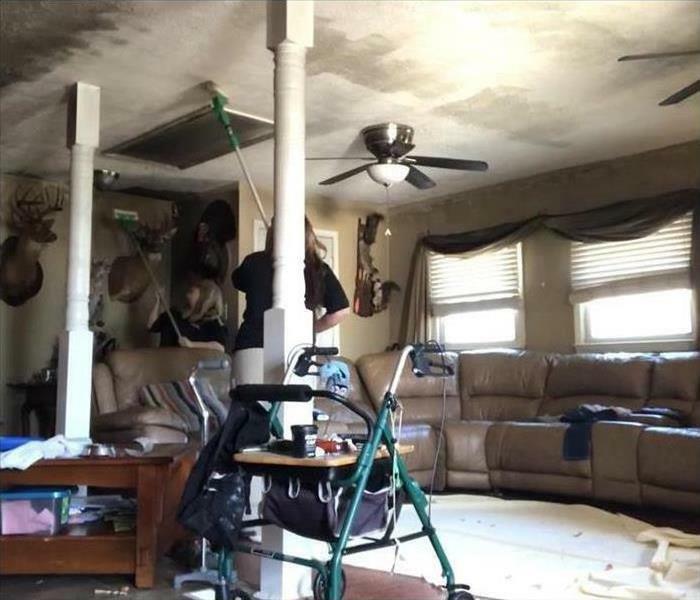 When we begin cleaning homes after a fire, we typically begin by removing as much soot and particulate as we can by sponging walls, ceilings and contents with a dry chem sponge. In this photo, you can see someone with our fire crew using a pole to sponge the ceiling around the attic entrance. While restoring homes that suffered fire damage, sometimes the concern isn't what you can see but what you can smell. 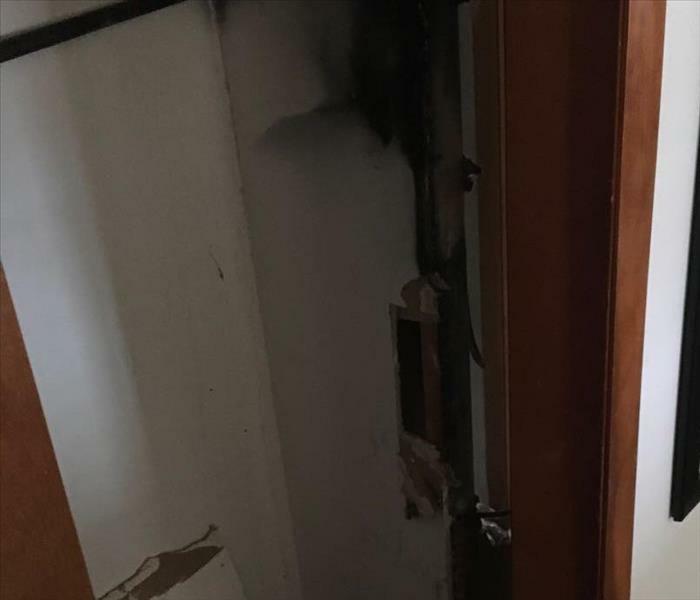 In this case, the homeowners were dealing with a very strong burnt smell in the entire home, although the fire damage was limited to a small portion of the house. Our crews have several different methods of deodorization, in addition to cleaning and restoration, so we were able to make the damage and the smell "Like it never even happened". Here is another example of our crews assisting in flood cleanup in Louisiana. In this case, floodwaters rose up to four feet inside of this home. You can see the pile of debris pulled from inside the home, which includes bits and pieces of wall and flooring that were saturated by floodwaters. 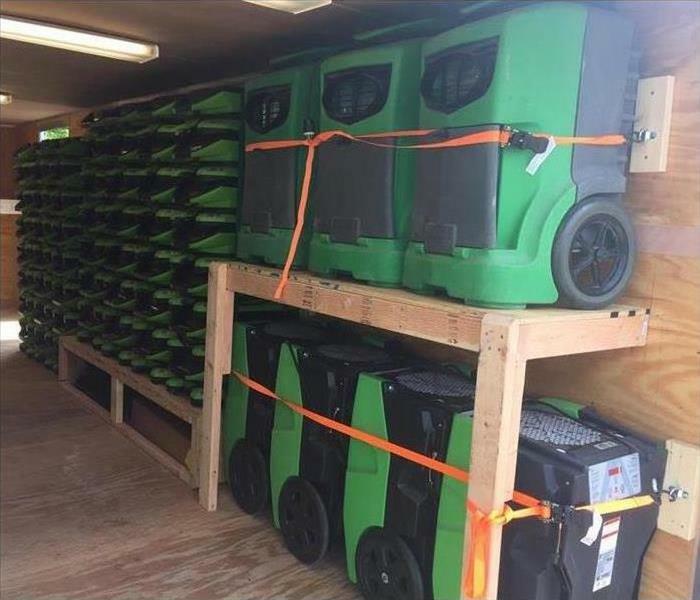 SERVPRO of Thomaston, Forsyth and Fort Valley has been called to respond to storms as part of a Disaster Recovery Team, helping homeowners in other states clean and rebuild their homes. 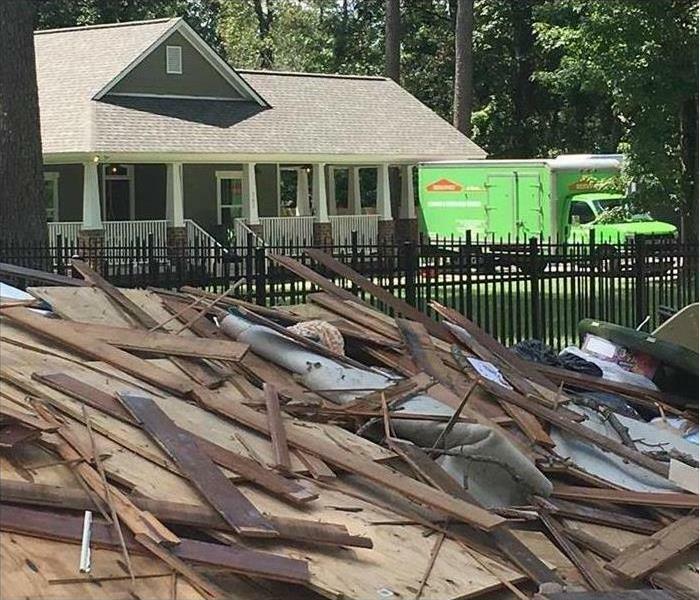 In this photo, you can see the pile of debris our crew helped pull from a home. 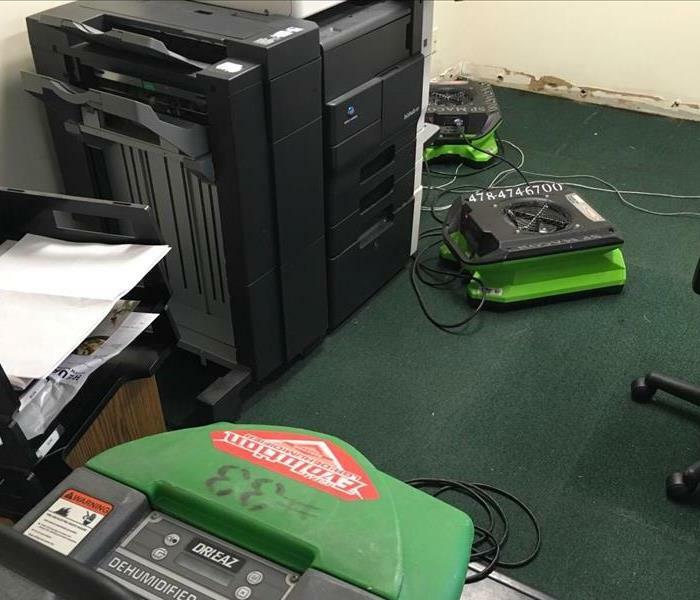 In this photo, you can see a small portion of the equipment we set up in an office space after a storm blew rain through the outer wall into the building. It was a bit noisy in the office for the next few days, but we got the area dry and were able to work around the employees to make it "Like it never even happened." 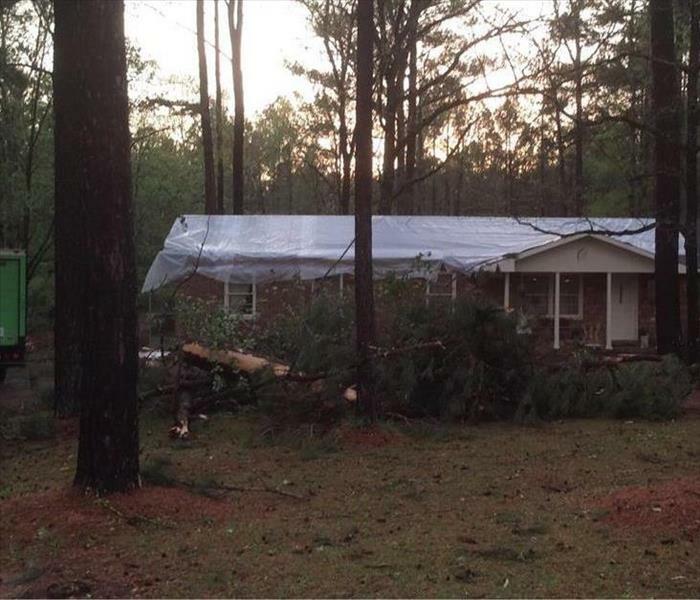 In this photo, you can still see what's left of a tree that fell on the roof of this home. 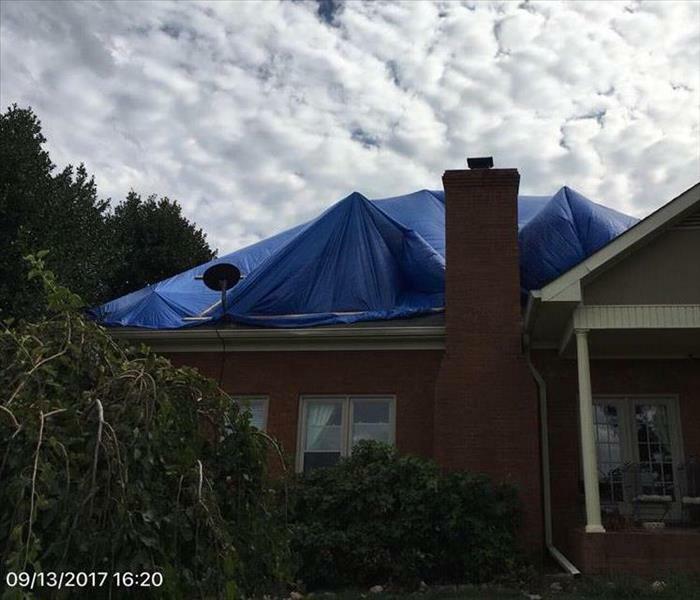 We helped this homeowner by tarping the roof, extracting standing water, removing bits of drywall that had fallen during the storm and treating the flooring with a deodorizer. SERVPRO of Thomaston, Forsyth and Fort Valley is only a phone call away if you experience any sort of roofing damage after a storm. We are able and willing to help tarp roofs, board up windows and set up drying equipment after the storm if needed. We are ready and able to travel to aid in any type of storm restoration work. 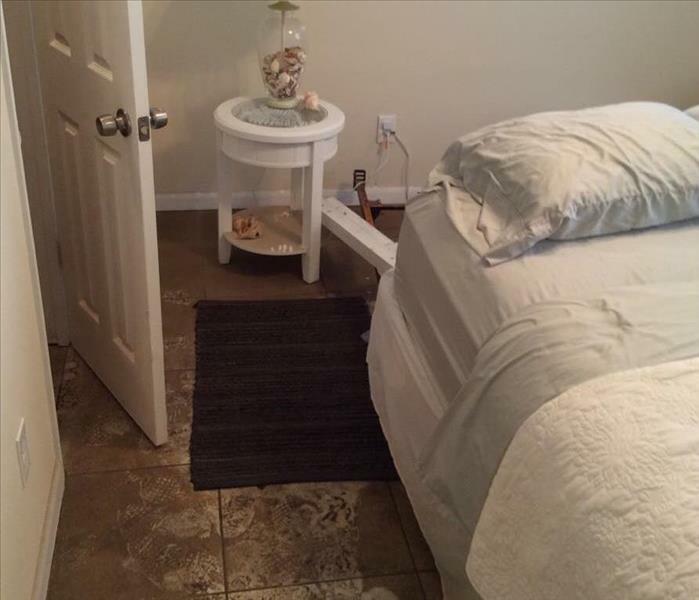 In this photo, you can see where flood water had pooled inside the bedroom of a condo, leaving behind mud and debris. In storm response, some degree of demolition inside the building is typically needed because of health concerns with the water (flood water can carry sewage and harmful bacteria). 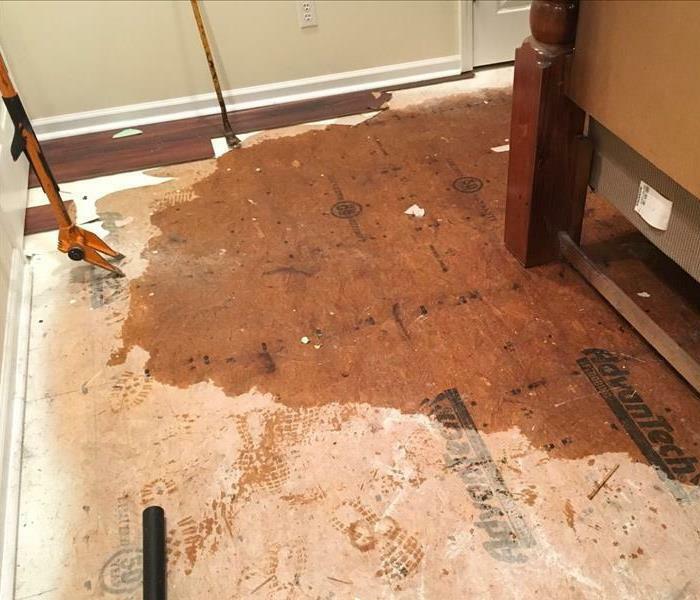 In this photo, we had to cut out a section of carpet in front of a fireplace after water leaked through the roof onto the flooring after a storm. 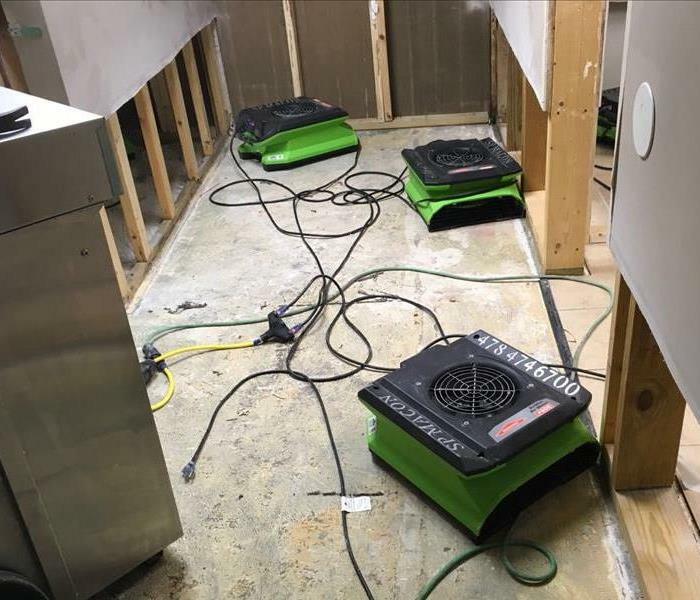 Our crew at SERVPRO of Thomaston, Forsyth and Fort Valley set up air movers to dry both the affected portion of ceiling in the room, as well as the flooring in this photo. 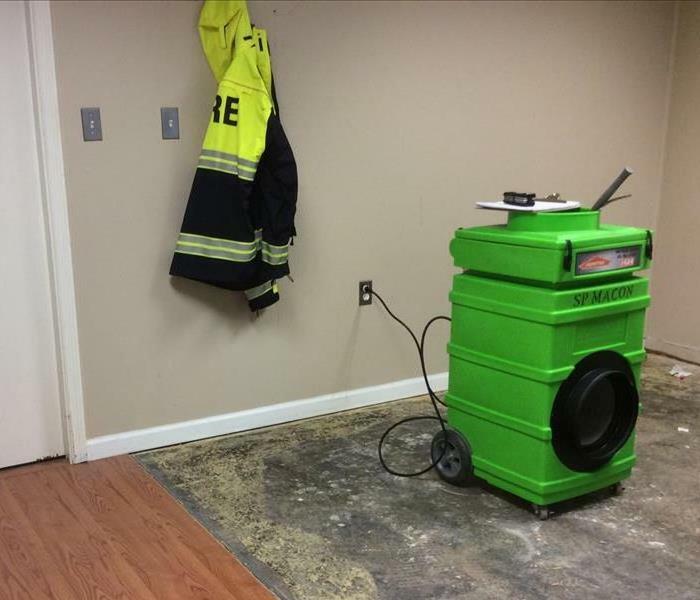 SERVPRO of Thomaston, Forsyth and Fort Valley specializes in emergency response to water damage. In the photo above, we were on scene with equipment to begin the drying process shortly after a leak under the kitchen sink was fixed. If carpet is still in good condition after being exposed to excess water (no delamination, frayed ends, etc. ), it is possible to save the carpet material. In this case, we stuck an air mover underneath the carpet and pad to evaporate the excess moisture while a dehumidifier removed the excess moisture from the air. 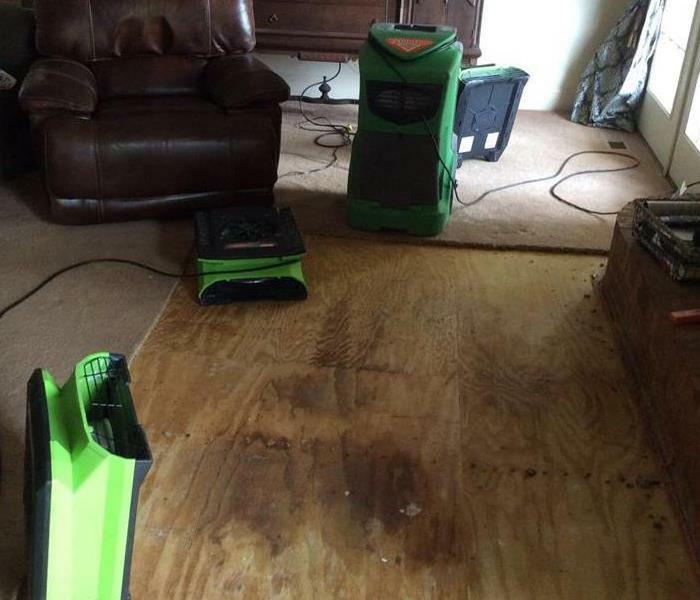 This photo is a prime example of why you should call SERVPRO the next time you think you have water damage. 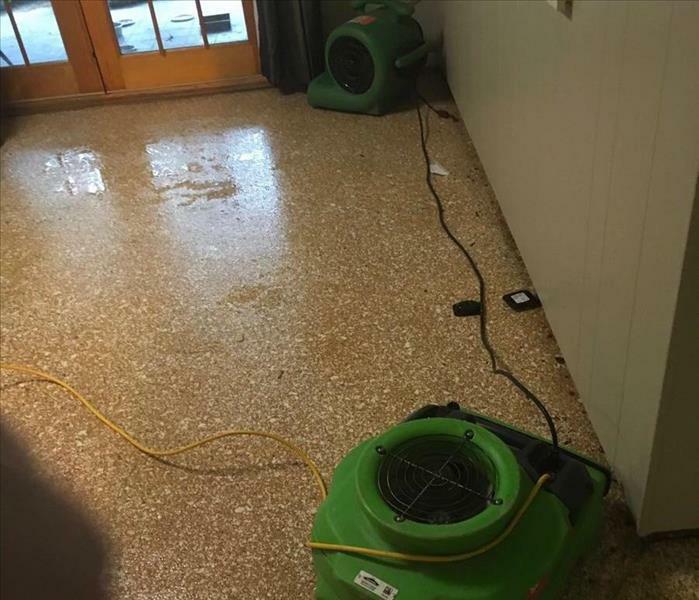 In this case, water had spread through the laminate flooring to get to the subfloor, which you can see in this photo is visibly wet (note the different shades of color where the moisture is concentrated). Before the top layer of flooring was removed, there was no pooling water or any other indicator you could see with the naked eye of how much moisture was trapped in the floor. 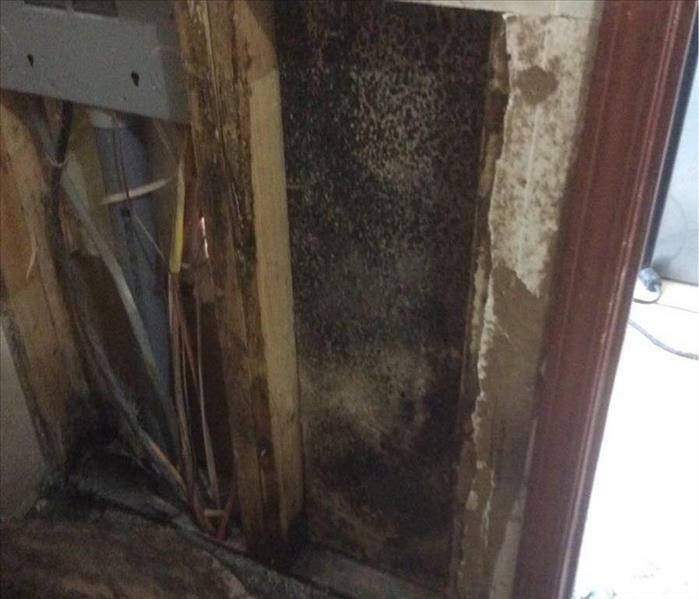 In this photo, we found what looked like microbial growth after a leak was found underneath a bathroom. While placing air movers and other drying equipment in the home to handle the moisture, we also treated this area with an antimicrobial agent to sanitize the wall cavity (removing 99.9% of the mold growth). Mold growth can start in as little as 48 hours, given the right amount of moisture, temperature and time to grow. In this case, mold was growing because of a small leak in a water pipe under this home. 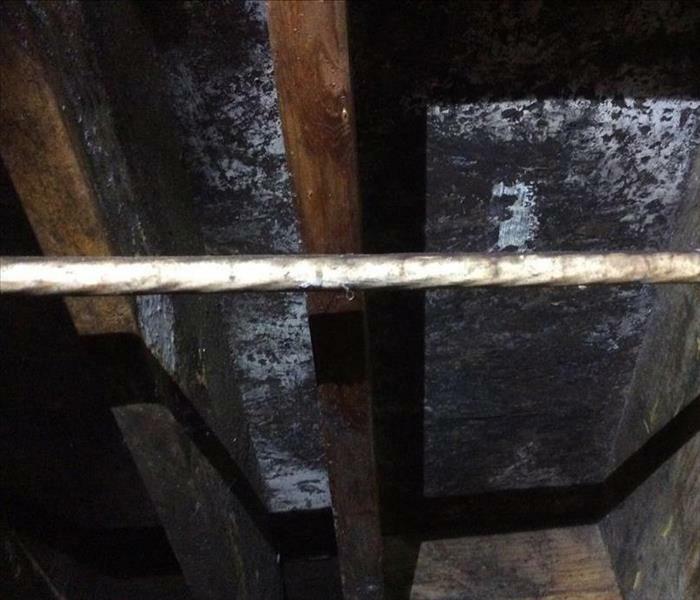 Our crew at SERVPRO of Thomaston, Forsyth and Fort Valley ended up cleaning this mold growth with the use of a HEPA filtered vacuum (to remove as many spores and growth as possible), as well as an encapsulating agent to seal the wood from further growth. When to Restore vs. When to Replace? At SERVPRO of Thomaston, Forsyth and Fort Valley, we prioritize restoration versus replacement of any fire-damaged belongings. 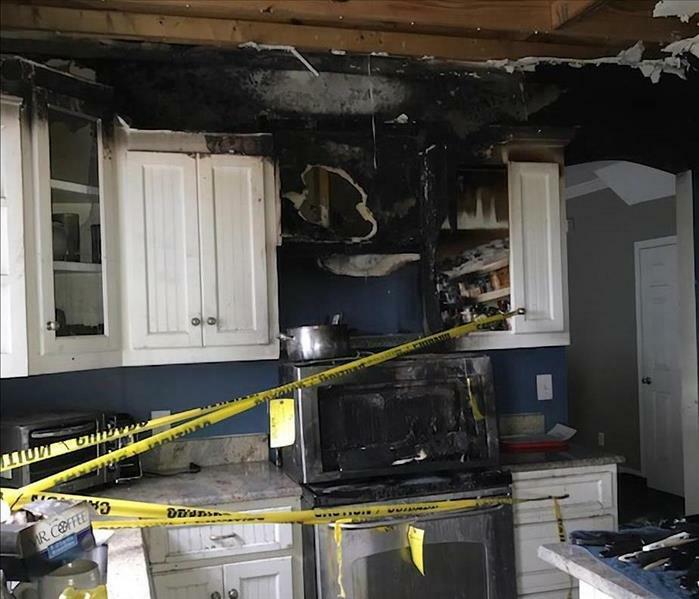 After a fire, a Project Manager will usually walk through the property with the customer or an insurance adjuster to look at the damage and make a recommendation on what can be cleaned or what needs replacing. Everything you can see in this photo ended up being replaced, but the structure and contents in other areas of the same kitchen were able to be cleaned. 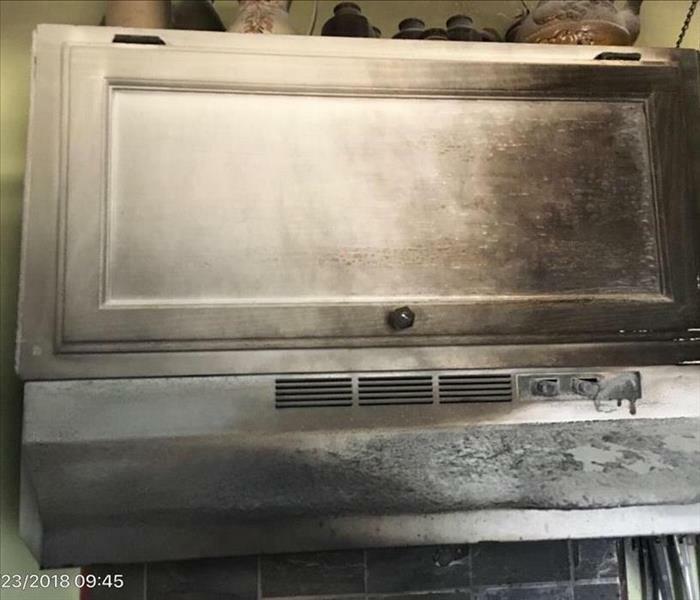 This stove fire left scorch marks on the upper cabinets and ceiling, which you can see in this photo, but this home required a lot more cleaning than simply the areas you can see. 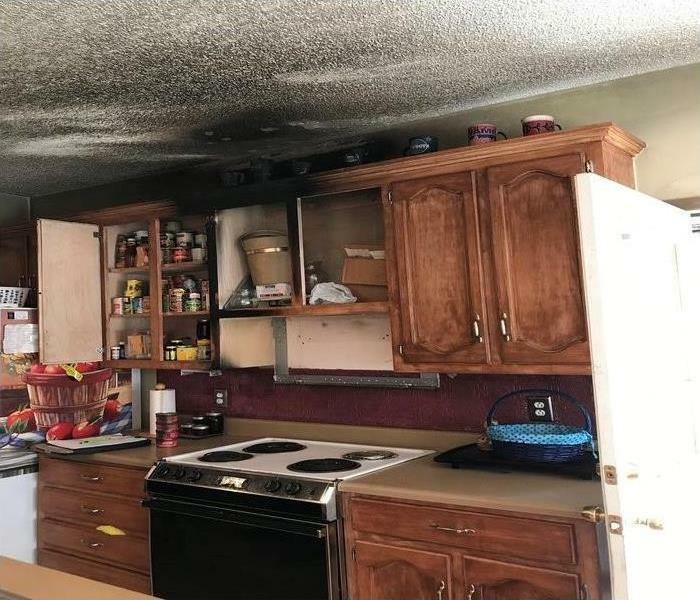 Our crew had to clean the inside and outside of all the cabinets in this kitchen, the popcorn ceiling and any contents in the cabinets (like canned goods) that could be salvaged. 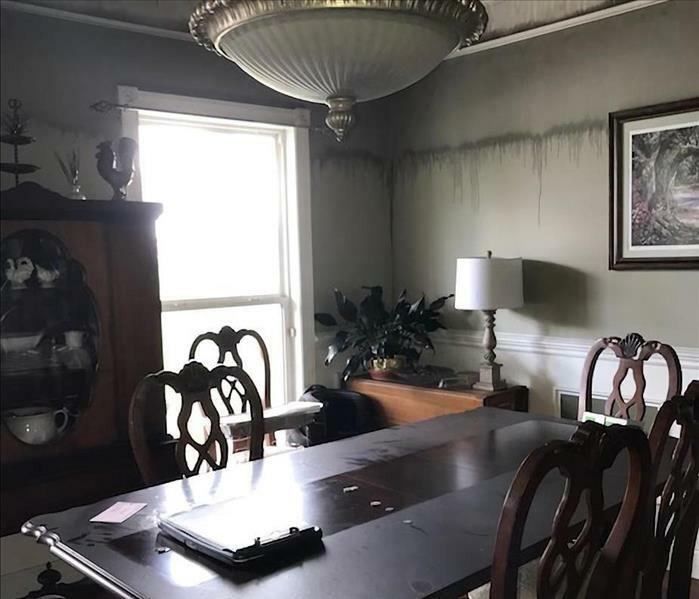 In this photo, you can see where the smoke gathered close to the ceiling, leaving differently shaded areas where the soot coated the wall thicker than others. We typically sponge walls to remove as much soot and odor as possible- a method we call "prep to paint". This is what the cooking area of the kitchen looked like before our crews began work with demolition and cleaning. This fire spread smoke and soot throughout the entire two story home, requiring several days of intense cleaning. The septic tank at a church backed up and flooded classrooms and gathering areas at a large Middle Georgia church. 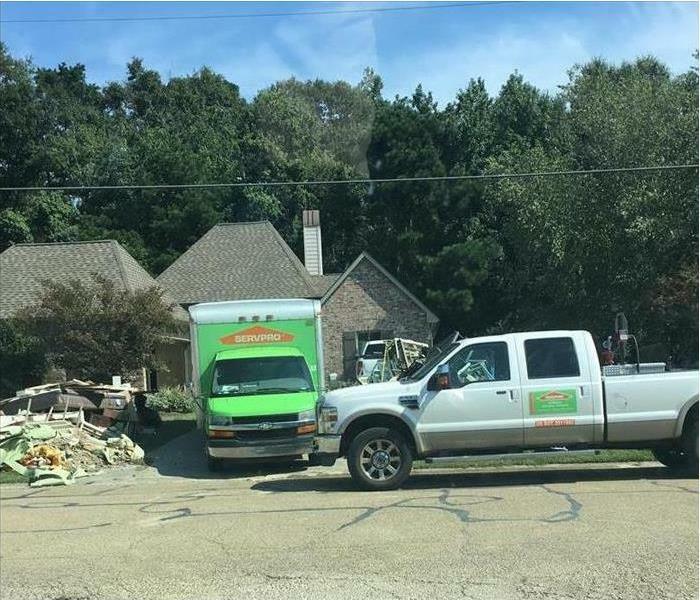 SERVPRO of Thomaston, Forsyth and Fort Valley came in and made it "like it never even happened", extracting the waste, cleaning/sanitizing the flooring and contents, plus completing demolition and drying the building structure. Church services were able to continue as normal because our crews worked around what they needed, making for one more group of very happy customers! A Fire Chief called SERVPRO of Thomaston, Forsyth and Fort Valley after he was notified about a roof leak and mold in one of their bunks. Our crew was able to get it dried and the mold removed after three days. We were happy to help our first responders and those responsible for saving lives and property from fires. This is what's left after a fire spread through an auto body shop, leaving charred vehicles and heavy smoke/soot damage. Our crew was only given one day to clean and deodorize as much as possible because the business had to reopen the next day. 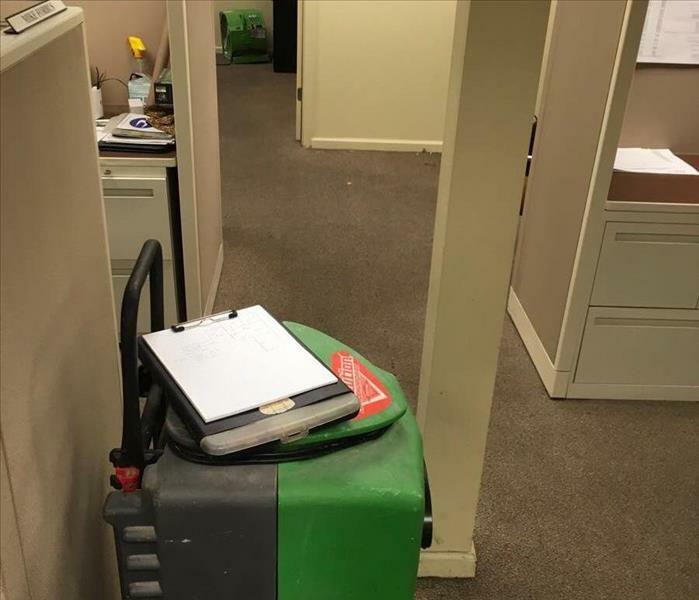 SERVPRO of Thomaston, Forsyth and Fort Valley was able to clean the entire office space and garage, and they were able to open for business the next day. 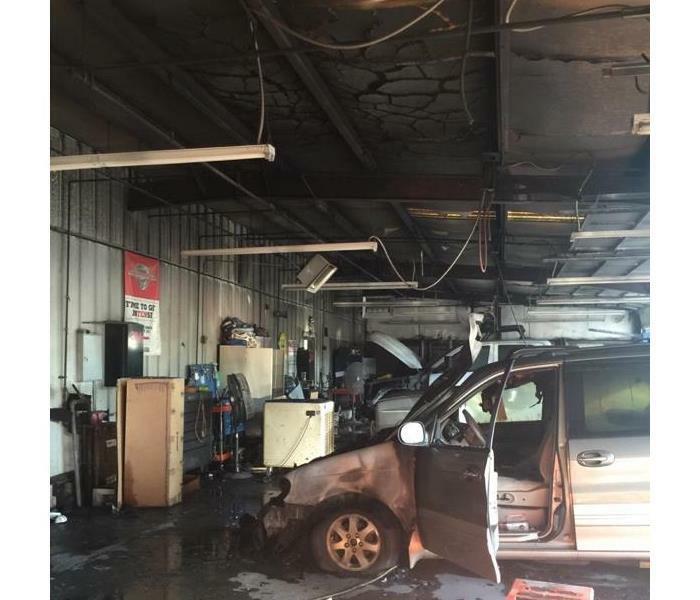 We understand that time doesn't stop for businesses or fire damage, so we worked with the owner to do what we could to get them back on their feet. 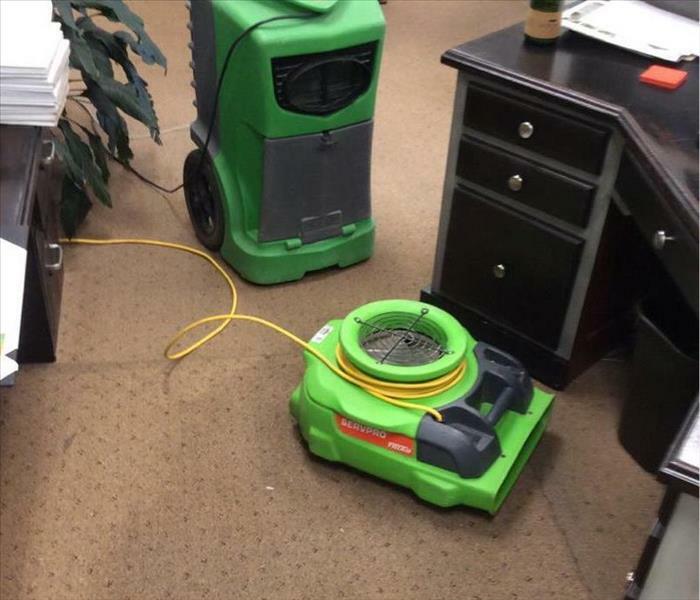 A roof leak left puddles of water and bad smells in this office space, but SERVPRO of Thomaston, Forsyth and Fort Valley was able to work around the office staff, drying and deodorizing the building. The staff liked us so much, they've used us two other times as well! 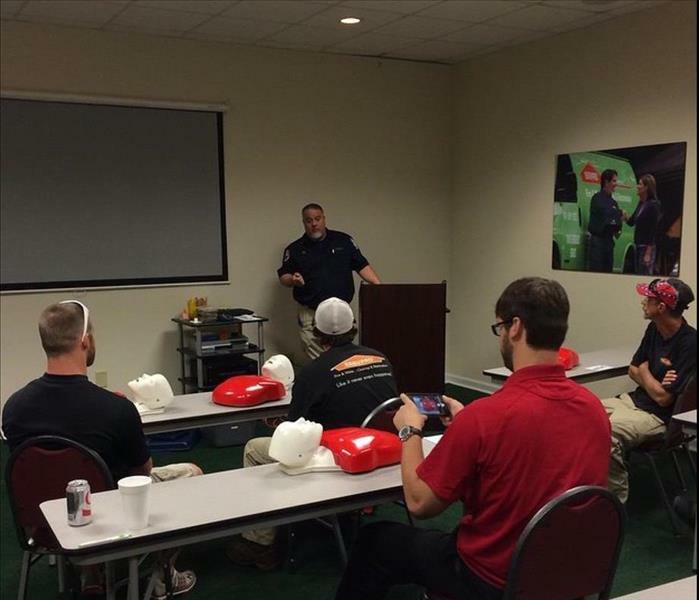 Getting certified in CPR is about much more than just satisfying the requirements of an employer. Aside from this, it provides people with the ability to save lives, the empowerment they need to jump into action when necessary, and the ability to use an AED should the situation arise. Daniel Stickler winning a beautiful white gold sapphire necklace donated by Kay Jewelers at our Annual Golf & Give Classic. We raised $5,000 dollars through our event. All proceeds were given to our local Methodist Childrens Home. Longest Drive Competitor, Jeremy Easterly, came down to support our Golf & Give Classic and to help raise money for our local Childrens Methodist Home. Easterly's best recorded drive is 441 yards!